GDPR or the General Data Protection Regulation created by the European Union in April 2016 kicks in today. It significantly spells out how anyone can collect and use our data and it affects anyone who uses the web and anyone who has a website. How does it affect us U.S. folks – especially the bait shop down along the River? First, if you've paid any attention to the Facebook / Cambridge Analytica situation, you can sense a change in how our culture may be on the precipice of shifting our social media habits since it's inception which I would argue was 2:13 AM, Friday April 17th when Ashton Kutcher beat CNN to a million followers. I couldn't help myself. The character "Data" from Star Trek and Mark Zuckerberg at Congressional Testimony April 2018. That was less than 10 years ago and I remember it like it was yesterday. Fast forward to March of 2017 where the S-Town podcast was downloaded 10 million times in it's first 4 days and then to this past March where Facebook took longer than expected to reveal that the personal data 87 million of it's users was obtained and as Fortune magazine states "helped elect President Donald Trump". People are starting understand what these numbers and who controls them could mean. Deep down, everyone knows this is something we're going to have to deal with probably sooner than later. Last year I fasted from all social media, Netflix and news for 5 months and it was the most profound experience I've had in at least a decade (strangely since I joined Twitter and Facebook in 2009). Not only did I gain tremendous insight in topics of journaling, meditation and my health, I became acutely aware of how little people interact with each other in public settings as they scroll through their phones. "Time Well Spent" is a nonprofit organization seeking to reverse their description of a "digital attention crisis", created by companies designing mobile devices and social media to capture as much attention as possible, regardless of their impact on users' quality of life. Seth Godin does a great job of explaining how marketing has changed when the Internet showed up as the first mass medium that wasn't created for advertisers. Something quite interesting and simple happened. Marketers had data in the form of clicks around the context of content to tell us for the first time a user's intent. And this became a drug for marketers – segmentation and targeting like we never had. But then it became a race to the bottom as advertisers competed for visibility while becoming accountable to clicks and conversions and we went from being people and customers to the product. Could Today be a New Tipping Point? So back to GDPR. The reason you're seeing all the privacy updates is because we're all playing on a world stage when we're online. And because many of the tools we use as digital marketers serve the world – like MailChimp, Squarespace, Yelp and those other companies that own 80% - 90% of their market share – they are not just accommodating what they're required to do for their customers in that part of the world, they are using this as a cue to embrace the coming tide of distrust, un-productive addiction and a titanic shift in how we use our new powers of connectivity with great responsibility. What's the Skinny on GDPR? There are several great articles on Medium.com (I've listed a favorite in the sources), but essentially, you have to be very specific about collecting any data from your audience which includes web submission forms, analytic data and emails you're capturing and what you're doing with it. If you're a small business under 250 employees, the regulation is more lenient but you can be fined as much as tens of millions of Euros (in proportion to the severity and scale of your violation). Many articles state that everything depends on how the enforcement process plays out but the opportunity lies in leaning into this rather than looking at it as tax or hinderance on your organization. We are using Squarespace's GDPR update to turn off the collection of IP address from the analytics for example. We've never used them for anything and in one click, it will be a signal to our audience that we take their privacy seriously and we're taking actionable steps to do something about it. We've also made the "Unsubscribe" button HUGE in our e-blasts for clients because not only is that GDPR driven but it actually drives up conversion rates when people self-select out of information that really doesn't pertain. Facebook made perhaps the biggest algorithm update to it's platform the beginning of this year with marketers I know seeing a 90% decline in reach over the past several months. Youtube's recent policy changes are creating similar loses for millions of account holders. Pair this up with what GDPR will force over the coming months and social media can be a big question mark as to how to approach and how much to invest. iGotMulch.com is killing it with social media. 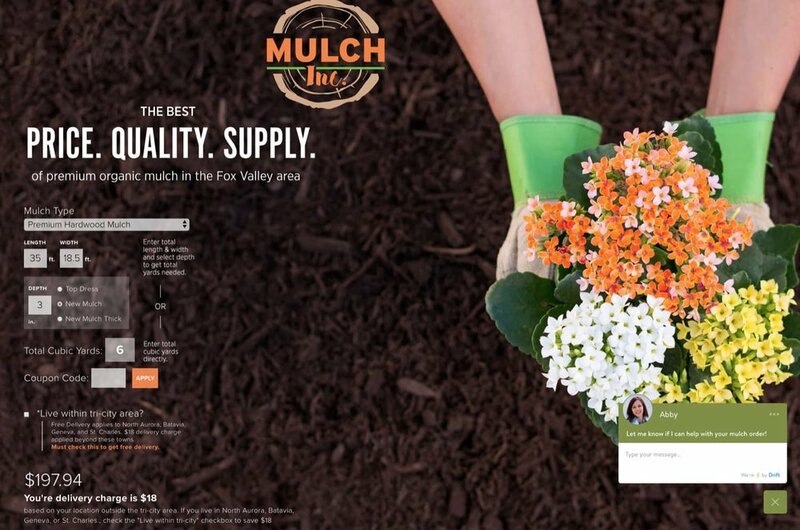 We recently designed a website for a local company supplying mulch. Because of the Facebook concerns our advice was to do everything they could to route people from Facebook over to their website and ask for an email address. Build a relationship via owned emails rather than staking too much in the rented spaces where reach would be unknown and potentially unstable. They came up with a weekly mulch free give-away where the winner is chosen from the pool of email addresses. They also added to the give away an extra yard of mulch for the winner if they could demonstrate a share on social media. When the contest was announced on Facebook, it was also boosted for only $30 total over the course of three days to a very local audience and they collected more emails than I'd ever seen with new sites who just release and announce. On the Facebook side, there are a lot of great comments and interaction with their audience, but on the website, along with the Drift chat application, visitors are becoming true customers demonstrating solid relationship building that Mulch Inc. completely owns and can't have taken away with an algorithm change. What if that's a good thing and the beginning of a revolution in how we build audiences. Ashton, as kooky as he was may actually have been on to something when he recognized individuals can stand toe-to-toe with established media companies. Joe Pulizzi and Rober Rose of "This Old Marketing" suggest that brands need to start thinking like a media company. Seth Godin proclaimed in the conclusion in the podcast above that each of us are our own media companies. 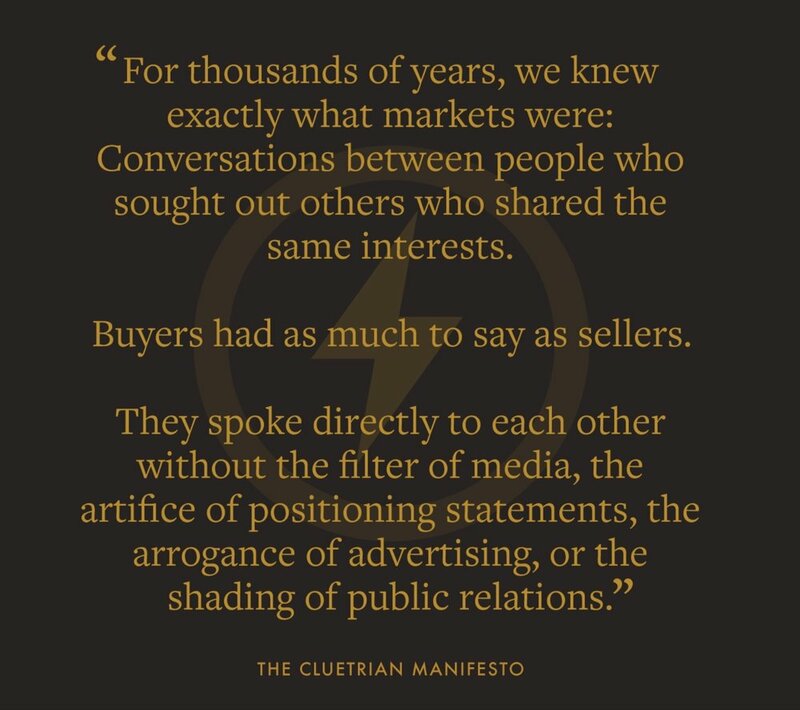 I love this quote I recently found from The Cluetrain Manifesto. It's in reflection of the idea that mass media obliterated the personal connection that once existed in markets. The web looked to promise to give that back but seems to have lost it's way. By the looks of it, GDPR might be the nudge we all need to start approaching our audience like neighbors in our community rather than numbers and conversions. We at Orbis are looking forward to helping people lead the way with new approaches like conversation driven marketing – but that's a topic for another post. Definitely hit me up if you've got thoughts on the subject.